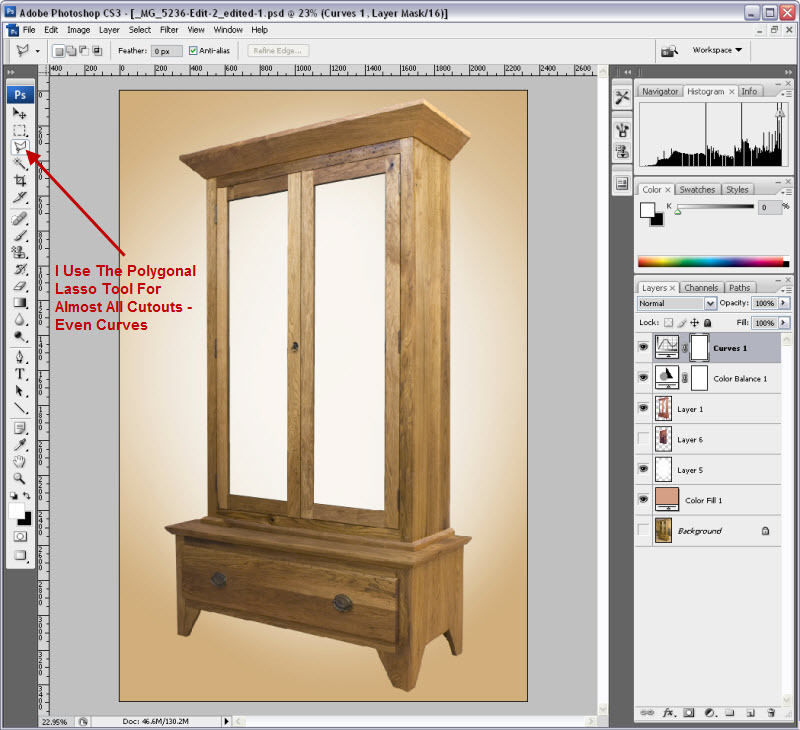 This is the last installment of “Woodworkers And Digital Photography”. 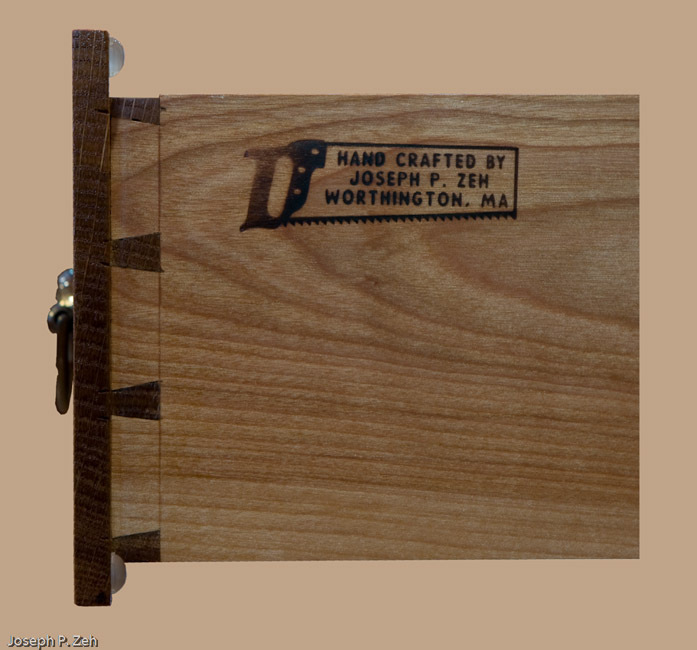 We are going to look at the final step in producing photographic images for a woodworker’s portfolio or website. This step will be illustrated using Adobe Photoshop CS3. It is not the purpose of this tutorial to teach you how to use Photoshop CS3, that would take a book and there are already many on the market far better suited for that purpose. What I want to do is give you a hint at what can be achieved by you the woodworker, without requiring a professional photographer, to produce a quality photograph worthy of your woodworking. I want to start off with a few examples of before and after pictures to show you that you don’t need expensive equipment and a studio. 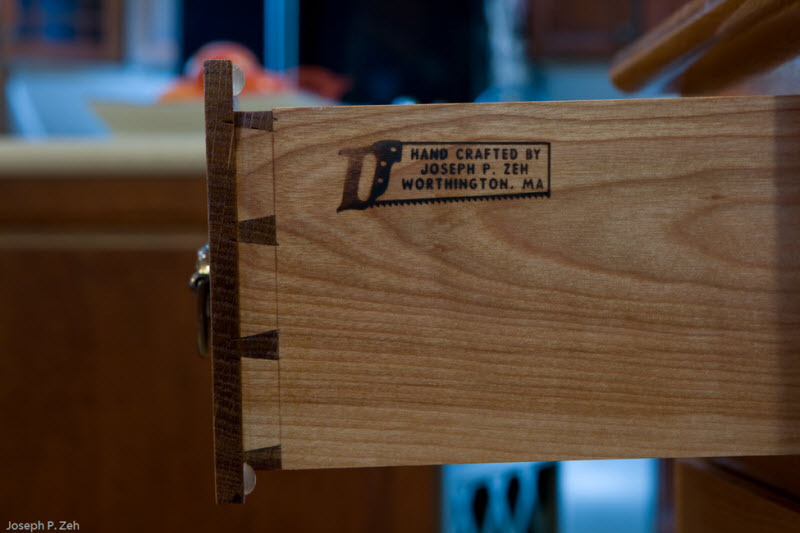 In the upper left is a close-up picture of a hand dovetailed drawer. It was taken in my dining room; you can see sunlight pouring through the kitchen window in the background and there are incandescent lights overhead. In the previous installment of “Woodworkers And Digital Photography” I showed you how to color correct a photo using a gray card in Photoshop Lightroom. 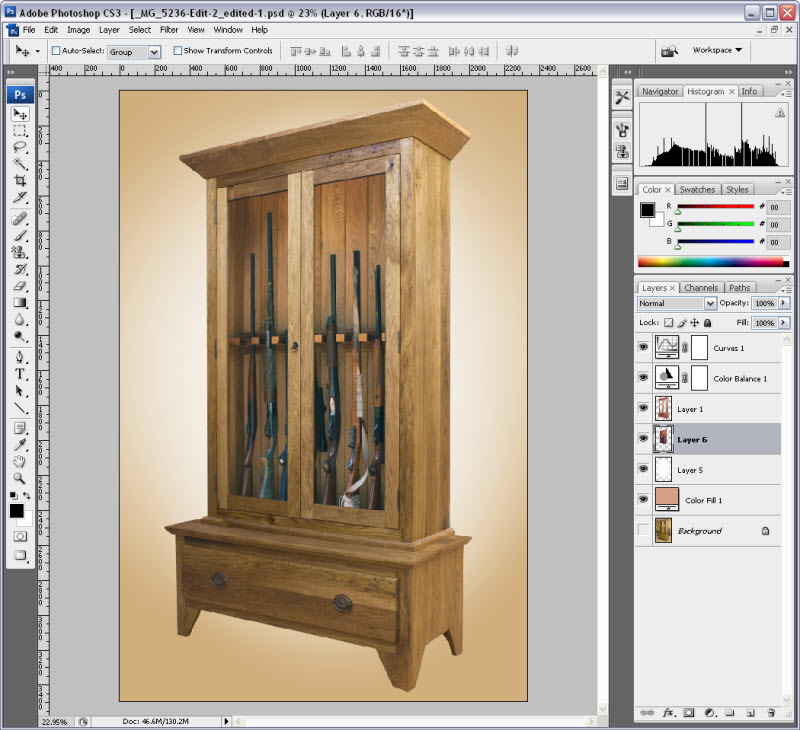 With Photoshop CS3 I have cut out the unwanted background, leveled the drawer by rotating the picture and placed a background of similar color. I did not provide a background spotlight for this shot. The result is the picture at right. 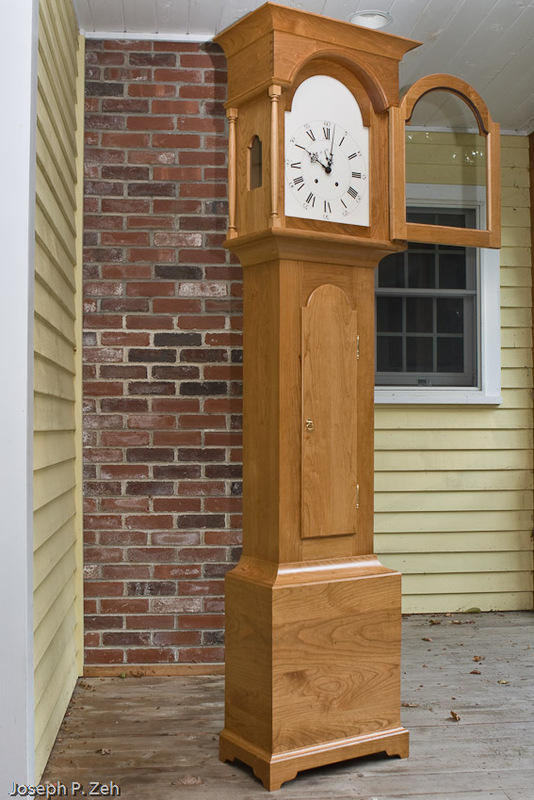 The picture at left is a Shaker Tall Clock sitting on my outside front porch. It was an overcast day which provided plenty of lighting with no strong shadows. None the less you can see glare in the clock face glass door. To remove the glare I took two shots (after test shots with a gray card): one with the door closed which you see at left and one with the door open which you see at right. Both were taken on a tripod and I took care to move neither the subject nor the tripod/camera combination between shots. You might notice the color difference in these two pictures. This was intentional. I wanted the adjust the color in the picture on the left for the most realistic color of the cherry. The picture on the right I wanted the white of the clock dial to stand out. After bringing both photos into Adobe Photoshop CS3, on separate layers, I was able to cut out the background on the picture on the left. I also cut out the glass/dial area. In the picture on the right I loosely cut out everything but the glass/dial area, leaving a little margin around this area in case my cutouts were not perfect. I then combined the two images with a black background to get the picture at left. I sometimes use a white or black background, but most often choose a color that exists in the image itself. The latter generally has a nice effect and does not draw attention to itself. Here, I think the black background worked well. In this next example I am going to show you how you can sometimes recover from mistakes or inability to get the right photos. 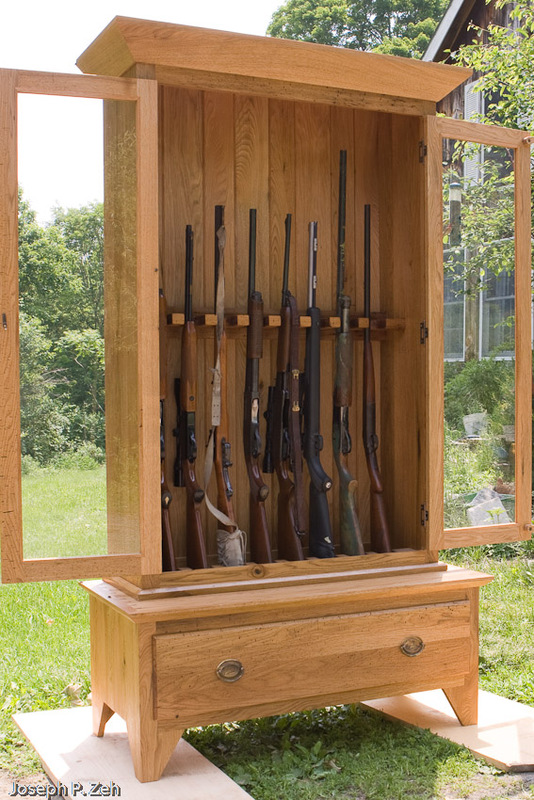 In this case I built a gun cabinet for a friend. When the piece was finished I took some pictures in my shop and color corrected them in Photoshop Lightroom. The first picture at right is with the doors closed. Again you can see the glare in the glass. 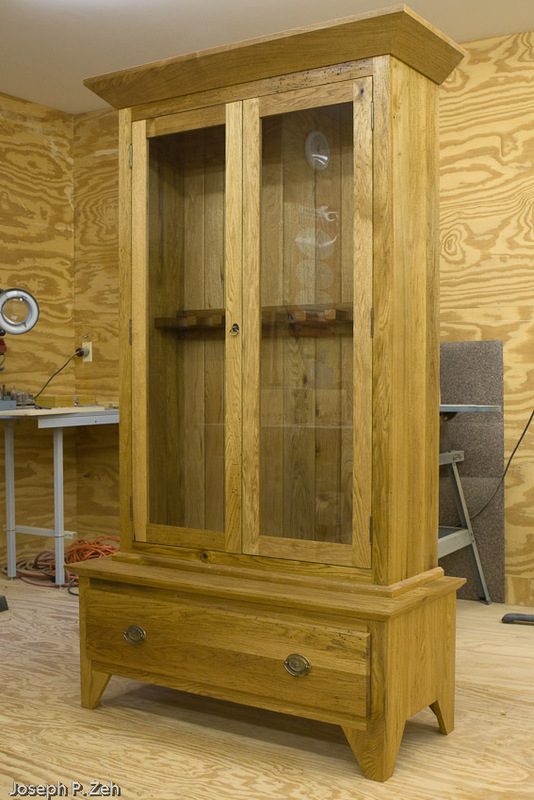 However, I didn’t have the guns to display in the cabinet. So on the day of delivery I took another photo of the cabinet, this time outside on his lawn, harsh sunlight and all. I was forced to shoot from the opposite side because of lighting. The resulting photo is at left. Notice the opposite angles of the pictures and the color differences. My goal was to bring these two pictures together into one photo which meant copying each of these photos onto separate layers in Photoshop CS3. Then I cut out the glass in the first picture. On the second picture I cut out everything but the insides. On this image, since I was not able to take both pictures together on a tripod, I also had to change the angle and size slightly. I used the Distort tool in CS3 to do this. See the image at right. I could also have mirrored or inverted side to side this image, but I would still have to resize it. So the Distort tool worked fine. Notice you don’t have to be perfect here. The eye is very forgiving especially with an image like this which has a lot of curves and non-straight line to give the eye expectations. 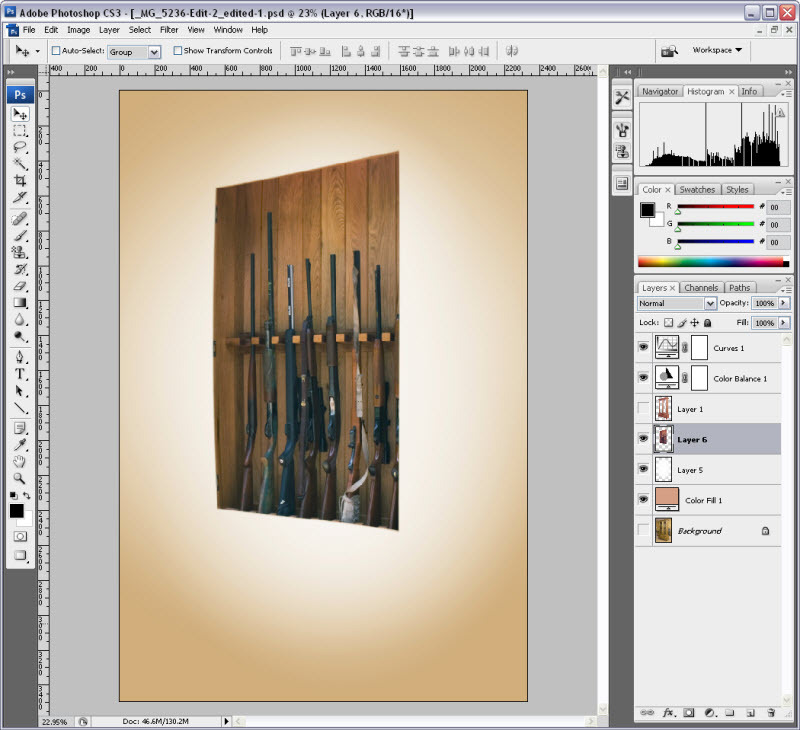 The picture above right, and the one at left with the glass cut out, is shown with the background color and a background spotlight. The color was taken from the image itself using the eyedropper color picking tool. I should point out that I use the Polygonal Lasso Tool fall almost all my cut-outs, even the curved areas. I find it much easier to control. 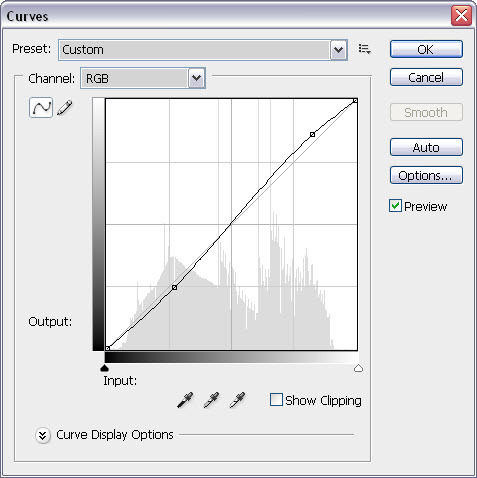 Just go slow, use short lines to approximate curves and work at the “actual pixel” level and it works great. The picture at right shows the layers I used to create this photo. The bottom “Background” layer is the shop picture. It is un-displayed, but a copy of it is on layer 1 with the glass removed. Layer Color Fill 1 is the color used in the background. Layer 5 is the spotlight layer. Layer 6 is the picture taken on site with all but the inside guns removed. Color Balance 1 layer was used to adjust the final color. Curves 1 is used to provide a little more contrast to the picture and make the Butternut wood stand out. You can see from the picture above right that the curve is a very familiar “S” curve photographers use to increase contrast. The final image is shown at right. I also added a very soft display light effect. Who would know that the guns weren’t there in the original photo? In most of the examples I have shown so far I had to cut out glass to remove glare. That can look artificial. Glass generally has color, normally green, and casts this color and anything behind it. This can be accomplished in many ways, but Photoshop CS3 has tools that allow you to create photo filters, much like the filters you add to a lens. 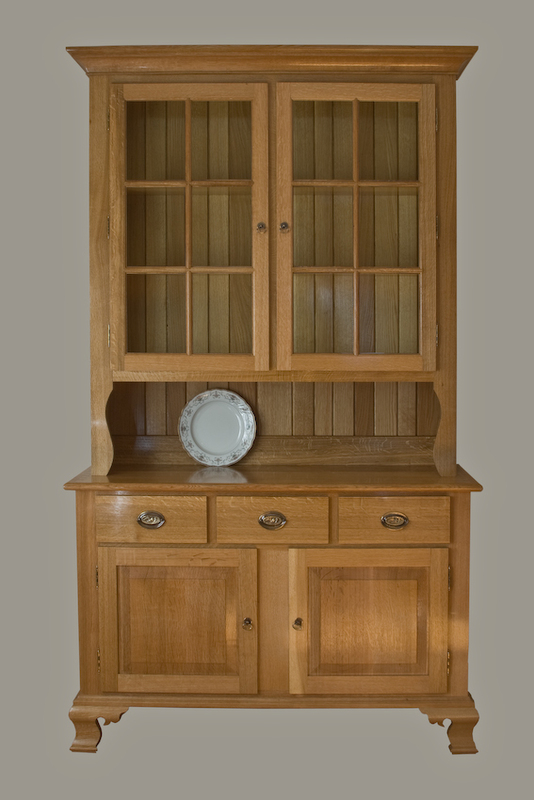 One such use was a Six Pane Oak Hutch photo I took. The picture on the right was taken in my sister-in-laws dining room. This was a hutch I built for her. The room is not large and to take the picture we had to hold a chandelier out of the way and I had to stand somewhat in the kitchen. The sun, which was quite bright and strong, streamed in for the window on the left through a white lace curtain. I had to remove the glass in each pane, but that looked unnatural. So I applied a filter to everything inside the hutch. The result is the picture at right. Notice the green glass. Well, this brings us to the end of this tutorial series. I hope it has been helpful and informative. I have a lot of hobbies: Flying (I am an Instrument Rated Private Pilot though inactive), Motorcycling & camping which my wife and I have combined on numerous occasions while touring the US, computer hardware and software which was my profession also, woodworking and photography. Photography, for me, has tied all of these together, and digital photography has certainly hit on my technical side. I can’t get enough of it. I hope I can find a way in the future to relate digital photography even more to woodworking, but for now this is it.